This example demonstrate how to create a RESTful API with Python, Flask and MongoDB. RESTful APIs using JSON on the HTTP protocol is by far the most popular approach to creating web APIs. They enable developers to think in terms of resources with actions on those resources like CRUD (Create, Read, Update, Delete). However, there are upcoming APIs like GraphQL which is increasingly becoming popular with many applications. In this tutorial, we are going to build a RESTful API to create, read, update and delete the documents (which will contain User information) from a Mongo database using Python and Flask framework. NOTE: While working with Python, we would recommend to use virtual environment to keep all the project’s dependencies isolated from other projects. If you’re using MacOS, you could use brew to start the server. A collection is similar to a table in a traditional relational Db. 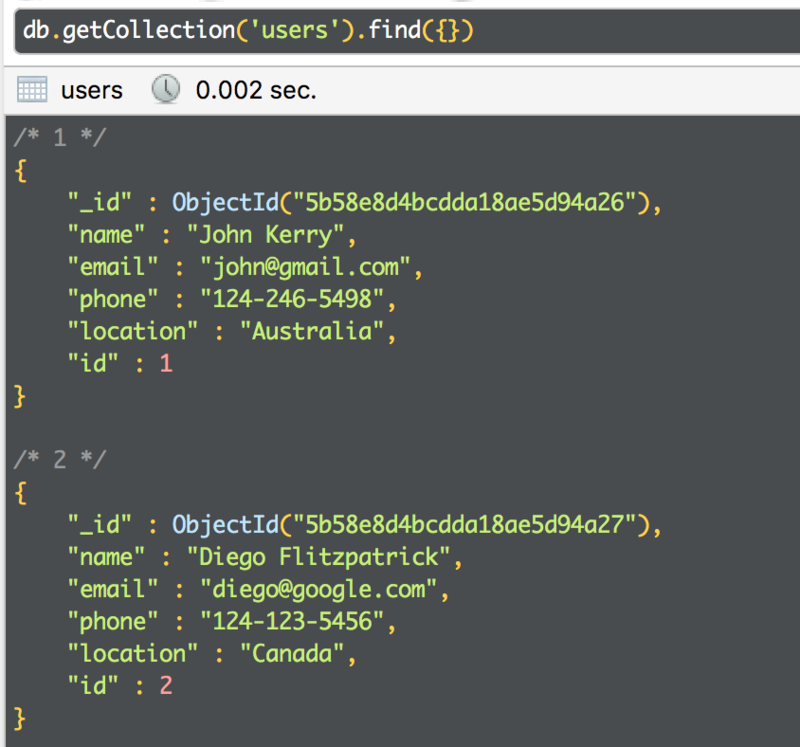 We will created a Users collection to store user details similar to a Users table in SQL. 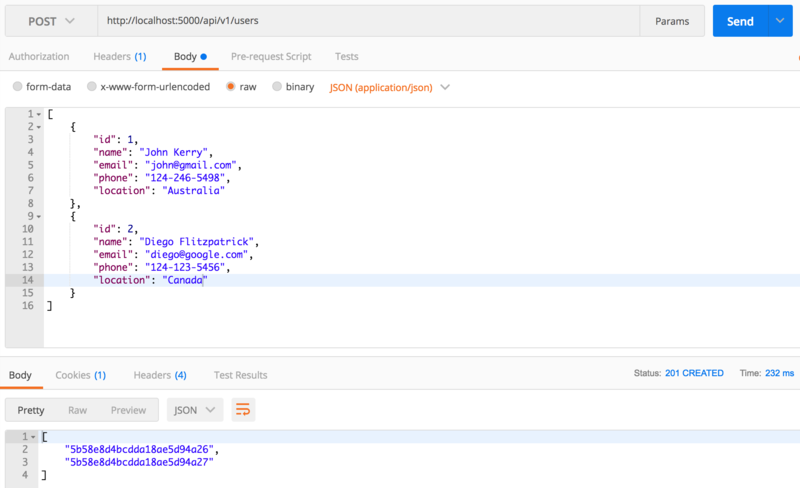 We will create an endpoint POST /api/v1/users which takes in a JSON object consisting of the user details like name, email, phone as JSON in the request body. We could also design the endpoint to take an array of users. Function to create new users. A single user returns the entity id so the frontend can reference the newly created item. On the other hand, an array of users returns an array of entity id. To fetch a list users which we just created, we will design an endpoint GET /api/v1/users and pass the search criteria as the query string parameters. Function to fetch the users. We will return the user details if the search criteria is provided else we would try to return all the documents if exists else we would return an empty array. Now, we will design an endpoint POST /api/v1/users/<user_id> to update the user details. Function to update the user. For example, we would like to update the document with id matches 1. Finally, we will design an endpoint DELETE /api/v1/users/<user_id> to delete the user from the database. Function to remove the user. We recommend to handle page not found request with informative message to the user. """Send message to the user with notFound 404 status.""" "msg": "This route is currently not supported. Please refer API documentation." If you would like to play around with the data, you could also use Robo 3T mongo shell. Moesif is the most advanced API Analytics platform. Thousands of API developers process billions of API calls through Moesif for debugging, monitoring and discovering insights.